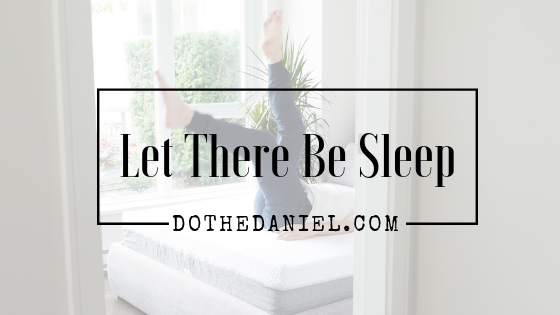 For all of you that follow Do The Daniel on Instagram, you’ll know that for the past few months I have been really busy with prepping a move, moving and then furnishing my new apartment. This has been quite the ordeal because I have always been someone who has lived in furnished or partially furnished places for years. When I moved into my new apartment, I didn’t own a single piece of furniture. No couch. No dining room table. No dressers. No bed. No mattress. Nothing. I was literally working with a blank canvas. In my last apartment, I had to move there for one year after my previous landlord of 5 years decided to sell. When I moved, I only had my clothes and a thin camping foamie I stole from my mom’s place from back in my boy scout days. Right as I was moving, this amazing opportunity came to partner with Endy and try out one of their mattresses for their “100 day trial”. I remember my first introduction to Endy was on Dragon’s Den when they secured a “three dragon” deal that was one of the highest investments to date in the shows history. Frequently when I’m on Facebook, I’ll scroll past Endy ads, and always stopped to watch the unboxing videos they post. But even after watching the videos, I still wondered how a COMFORTABLE mattress can fit into a box the size of a hockey bag. I was skeptical to say the least. When the boxes arrived at my door, it was a little shocking that a mattress could actually fit in that box. My first concern as a single guy, who doesn’t work out as much as he should, is how I was going to unbox this on my own. I placed the box on top of my bed frame and opened it up, pulling out the rolled-up vacuum sealed mattress. After unrolling it, I placed it where it would sit on my bed frame. Inside the box, they include a cutting tool to open the plastic. As you open the plastic, you get to have a Harry Potter moment as it magically puffs up, no wand or abra-ca-dabra needed. Also, all of their packaging is completely recyclable and the cardboard boxes are made from FSC Certified [which means it comes from a forest and supply chain that is managed responsibly) Cardboard boxes. I have never been one of those people that can lay down and fall asleep as soon as their head hits the pillow. For there is a complicated multi-step process involved to get me to the point where I can start to drift off. First off, I had to create this very intricate formation of pillows to raise and support parts of my back and my arms (I’m a side sleeper – I generally pillow behind me, two pillows under my neck, and one for between my two legs to sleep comfortably – no wonder I’m single). This “pillow formation” was also to counter the firmness of the last mattress I had in the last furnished place I rented. I also am someone who would run on about 4 hours of sleep a night, and I would never hit a deep sleep. I was literally re-defining tossing and turning. I had an ex-boyfriend that said I would “do an Olympic gymnastics floor routine” in my sleep, occasionally waking up with my head at my footboard, and him on the couch. 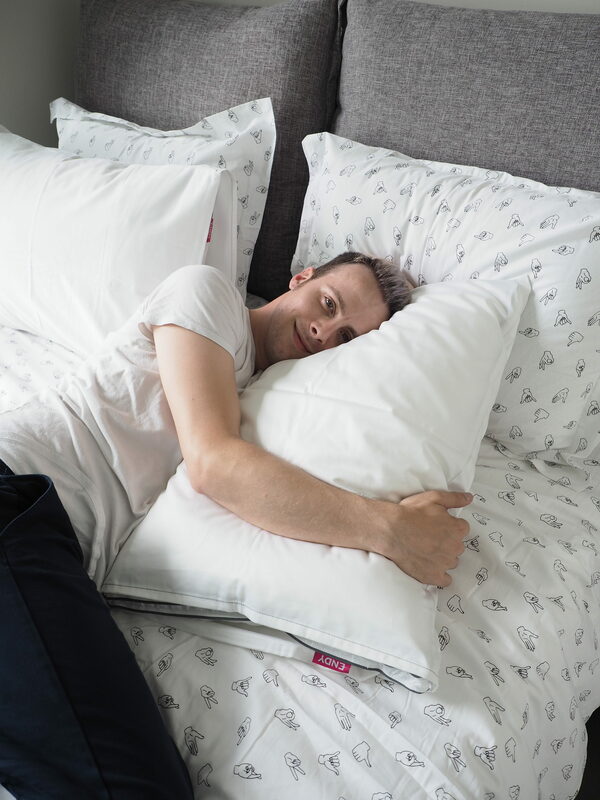 The first thing I noticed when getting to bed the first night, was that the two Endy pillows were actually enough for me to sleep with – although I do still have another pillow I use for between my legs because I still mostly sleep on my side. I kept mine with all the filling in them that they came with, because I prefer a denser pillow. The Endy sateen weave sheets are cool to the touch. However, the star of my notably improved sleeping patterns, is the Endy mattress. I like that the firmness is about medium and hugged my body while I slept. I felt less pressure on my lower back and an overall more comfortable sleep alignment. Although, I did notice a problem when I woke up in the morning. I had a complete unwillingness to get up. I somehow managed to also sleep nearly 8 hours without waking up multiple times, which is nearly double what I normally sleep. It takes me almost no time to get comfortable enough to fall asleep. A process that would sometimes take 60-90 minutes is now down to just a couple. My skin has gotten a lot better from getting more restful sleep, and my dark circles have gone down significantly. I’m getting sick way less often, and don’t need melatonin to fall asleep. Less frequent visits to my chiropractor for adjustments (I used to go 1-2 times a month). I’m less likely to kill someone in the morning before getting my coffee. Also, even 100 days in and after spending a lot of time on my bed sleeping or binging Netflix, there is no lasting indentations on the mattress foam. I took the cover off and it looks the same as it did the first day I unboxed it. The Endy Mattress is designed and made in Canada and is comprised of 3 layers. The top layer is the “Endy Comfort Foam” which is engineered for “optimal comfort and temperature performance”. The foam’s top layer uses open cell technology which allows heat to dissipate from the body faster, providing a cooler sleep. 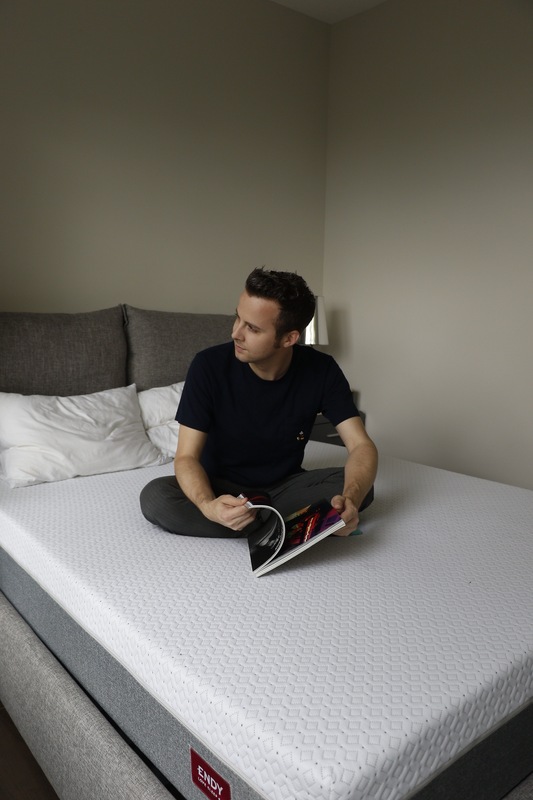 The middle layer is the “Transition Foam” that allows a “gradual transfer of energy from the comfort- focused top layer to the high-density support core”. It’s this transitional foam ensures that if your partner or pet gets out of bed in the middle of the night, you won’t feel them getting in and out. The last layer is the “Support Foam” which is much denser and gives your body the support it needs while you sleep. The unique combination of these three layers is what allows Endy to stand apart from the competition. The cover is made of an ultra-soft micro-quilted hypoallergenic stretch knit, that can also be removed and machine washed. The Endy Sheets are made from 480-thread count sateen weave cotton, which is light and soft to the touch and very breathable. For me though, it’s all about the design of the fitted sheet, that really got me smitten with them. One of my biggest pet peeves is having to wrestle my fitted sheet to get it on my mattress, only to have it slip off in the middle of the night. The Endy fitted sheet has a very strong and durable elastic that goes around the entire base of the sheet – not just the corners like most sheets. I have a couple stories about them in the Endy highlight on the @DoTheDaniel Instagram. In one story, I put the fitted sheet on by myself in less than 15 seconds (without speeding up or using time lapse!). 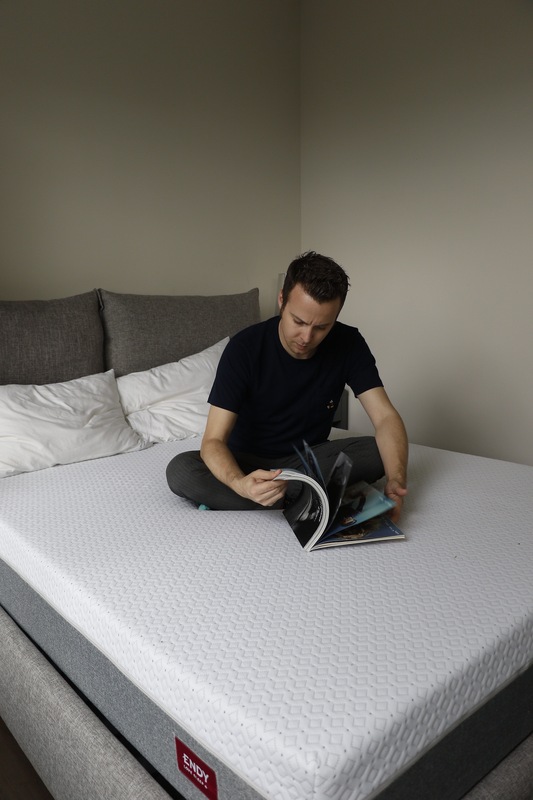 If at this point you’re still unsure if the Endy mattress is right for you, take advantage of their 100-day sleep trial and decide for yourself. You can literally sleep on your decision and see if it’s right for you. Yep. That’s right. They will give you 100 days to try it out at home and decide if the mattress is for you. If you decide you wish to return it, all you have to do is email them and they will coordinate to PICK IT UP (yep, they will come get it for you) and REFUND you NO QUESTIONS ASKED. They also take the returned, gently used mattresses to their registered charities and non-profit partners, that help families in need. 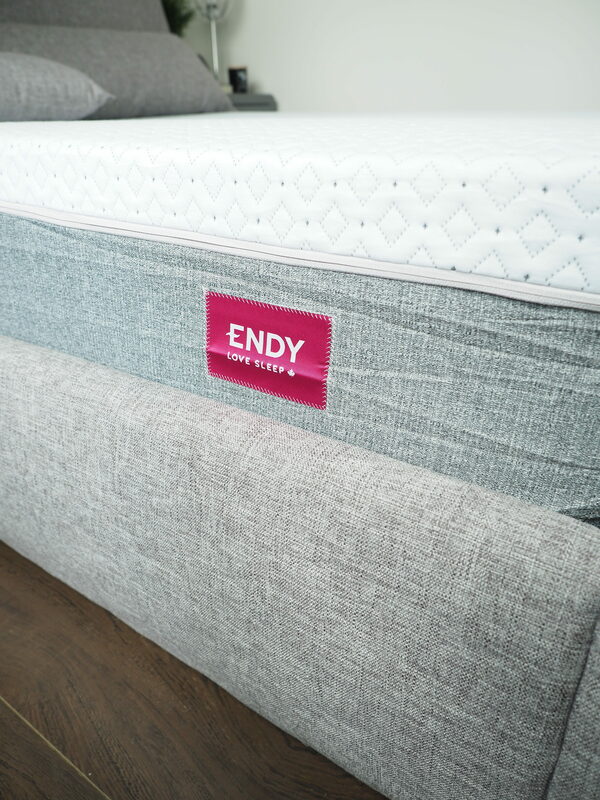 With our partnership with Endy, we are offering you $50 off any size Endy mattress by using our Promo code “DTD50” at check out. You can also see all the stories during my 100-day trial with Endy on the Endy highlight on the DoTheDaniel Instagram! Make sure to follow along with on my Vancouver adventures via my Instagram account and my#DoTheDaniel adventures on the West Coast & around the world! Until next time, dare to dream!